You don’t have to live in pain. We have helped nearly 1000 TMD patients find relief. Call for an evaluation before the pain is unbearable. Looking for an alternative to CPAP? Get relief from snoring and nighttime breathing problems with FDA approved, specialized, custom oral appliances. Get back to living your life! Don’t let the effects of TMJ, Sleep Breathing Disorders and nighttime breathing problems slow you down. TMJ & Sleep Solutions specializes in treating TMJ/TMD and Sleep Breathing Disorders. Dr. Mark Barnes offers a compassionate approach to diagnosis and treatment with over 30 years’ experience and the latest diagnostic technology. Our team is dedicated to providing individuals with relief from facial, neck, and head pain and from the disruption caused by snoring, along with the potentially life threatening health risks associated with Sleep Breathing Disorders. We focus on identifying the root cause of pain and treat the source to seek a long lasting solution and an improved quality of life overall. Custom and highly specific orthotic appliances are provided for differing TMD conditions and offer an alternative to CPAP for patients suffering from snoring and Sleep Breathing Disorders. Sleep Breathing Disorder Questions? Take this private SLEEP RISK ASSESSMENT. Request your comprehensive SLEEP EVALUATION. TMJ/TMD Questions? Take this TMD SCREENING QUESTIONNAIRE, only 8 simple questions to answer. Snoring often deprives the brain of oxygen and deprives others of restful sleep. 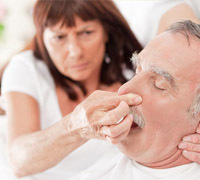 Snoring has been shown to contribute to carotid artery calcification's and frequently progresses to Sleep Apnea, a life-shortening condition in both men and women. But you can alleviate snoring with custom oral appliances and protect against developing Sleep Apnea. Apnea (stopping of breathing while sleeping) increases your risk of stroke, heart attack, insulin resistance (pre-diabetes) and high blood pressure among other serious conditions. 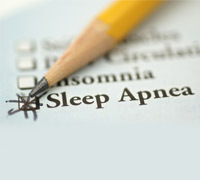 Sleep Apnea may lead to early death from the many related diseases. We provide comfortable, custom oral appliances as an alternative to CPAP. Clicking, popping, grinding, sounds of a joint self-destructing may be signs of TMJ disorder. It can lead to constant pain, headaches and migraines, ear pain and an inability to chew or open your mouth. 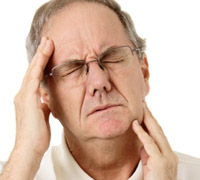 Dr. Barnes is both credentialed and experienced in non-surgical treatment of TMJ disorders. Don’t wait until it hurts. Stay up to date with TMJ Sleep Solutions News, Tips and more. "Ten years ago I injured my jaw biting into an apple. It was very painful and I couldn’t close my mouth for a month. Finally I was able to chew again, but my jaw continued to hurt. I was told I had TMJ. Over the next ten years, I saw four doctors, three dentists, an ENT and three chiropractors, none of whom could help me. My last chiropractor told me about Dr. Barnes. When I first went to Dr. Barnes, I could not open my mouth except for a slit big enough for a cracker. I was unable to chew, living on baby food and was in severe pain. Dr. Barnes took a special xray of my jaws and said he thought he could help me. Was music to my ears. After ten years, here was someone who could help me. He first had to give me two shots to release my jaws so I could open my mouth enough to make a mold of my teeth. Katherine, who is his wonderful assistant, then made a special mouth guard to fit over my bottom teeth with raised sections over the back part of the guard. It’s hard to explain, but it made my jaw rock so that it would not get stuck again. For the next three months I wore this guard 24 hours a day except when eating. The next three months, I was able to go a couple of hours twice a day without wearing it and finally I wear it only at night. Honestly, I was really skeptical when they said this little mouth guard would solve all my jaw problems, but as time went by and my jaws healed, I was able to open my mouth wider and wider. Today after 1 ½ years, I had my last check-up. I can open my mouth as wide as ever and eat anything I want. Dr. Barnes and Katherine were truly a God send to me. Without them, I don’t know what I would have done. I would highly recommend anyone who has TMJ or any jaw problem to see Dr. Barnes. He and his entire staff are kind, courteous, helpful and just plain wonderful." "In December of 2015, I yawned a little too wide and felt a pop in the right side of my jaw. This wasn’t the first time this had happened to me, so I thought, I would just pop it right back in like I had in the past, only this time it didn’t go back in. The first few hours were miserable, I couldn’t eat, I was in a lot of pain, and I thought about it constantly. I immediately started to google ways to remedy a “dislocated” jaw. I tried everything, but despite my efforts, nothing worked. I was stuck. Over the next few weeks, I talked to as many people as I could think of to get multiple opinions. Being that I’m a nurse, many of the people I spoke with are healthcare professionals (doctors, nurses, anesthesiologists, etc.) and most people recommended physical therapy or talking to a maxillofacial/oral surgeon. Yikes! I did not want to go the surgery route, but the seed was planted and I was fearing the worst. In the interim, I tried physical therapy, chiropractics, acupuncture, and I saw 2 different dentists. Many of these practitioners tried to manipulate my jaw back into place, but unfortunately, I didn’t get any results from this. All of this occurred over the course of about 3 months. I was getting desperate and fearing the worse. After talking with one of my dentist's, he suggested that I look for a “TMJ specialist”. I thought, “A what?” I had never heard of a specialist for TMJ before. I was so focused on the “dislocation” of my jaw joint that I didn’t think of the root cause of my issue, which was the fact that I had bad TMJ. So, I did a search for a specialist in the Boulder area and found Dr. Barnes. I researched their treatment plan and decided that wearing dental orthotics for a few months would be a much better option than surgery. My first evaluation with Dr. Barnes revealed that I had arthritis forming in both jaw joints and my disc’s were misaligned. At the time, I had difficulty opening my mouth wide, but I had minimal pain. I realize in retrospect that I could have easily ignored all of my jaw issues because my symptoms were so tolerable, but upon learning that I had mild arthritis at the age of 29, I’m really glad that I continued to seek help. Now I see that my dislocation was actually a blessing because it prompted me to get help for my TMJ symptoms that I had always just accepted as “normal” beforehand. Dr. Barnes’ verdict was that I would need to wear a day and night time orthotic for 3-5 months. Getting used to wearing the orthotic was a challenging process for me, but Dr. Barnes and his staff were very supportive and always available to help me with any questions I had. Five months after I started to wear my daytime orthotic, I made significant improvements. My jaw range of motion is now normal and I continue to have little to no discomfort in my jaw. I can’t wait to have my follow up CT scans in a few months to see even more of my progress. It’s great to know that Dr. Barnes and his team managed my treatment in a minimally invasive way, sparing me the pain of going through surgery, both at the time of the dislocation and hopefully for the future as well!" "Dr. Mark Barnes and his team were a huge help to our family when our son suddenly experienced severe TMJ symptoms (jaw locking). With very little time before our son had to leave for summer camp, Dr. Barnes and his staff thoroughly assessed the problem and made a mouthpiece to be worn at night. This device worked like a charm and continues to entirely manage our son’s TMJ issue. In addition, when it was time for our son’s wisdom teeth to be extracted, Dr. Barnes consulted with the oral surgeon to ensure that the procedure would not aggravate the condition. That also went off without a hitch. We wholeheartedly recommend TMJ Sleep Solutions! We felt very well cared for by Dr. Barnes and his detail oriented and highly responsive (emails on the week-ends!) staff! Gratefully, A.M."
“I have had many wonderful experiences with the care and service received from Dr. Barnes and his office. I have referred many of my colleagues and family members and will continue to do so." "After suffering with a prolonged mono diagnosis it was discovered that I suffer from obstructive sleep apnea which was treated with a CPAP machine for over 3 years. I finally became intolerant of the CPAP machine and how cumbersome it was to travel with so I came to Dr. Barnes to try orthotic appliance therapy. Since starting therapy with the oral device I am able to achieve deep REM sleep nightly and it has eradicated my daytime sleepiness and the need for a daily two hour nap. I now bike regularly and feel 30 years younger thanks to the deep restorative sleep I am able to achieve with my oral appliance. I feel cured in more ways than one; it's truly been a lifesaver."